Notice a difference in your phone volume? Online inquiries? A Google Search Engine Results Page (SERP) change may be responsible. 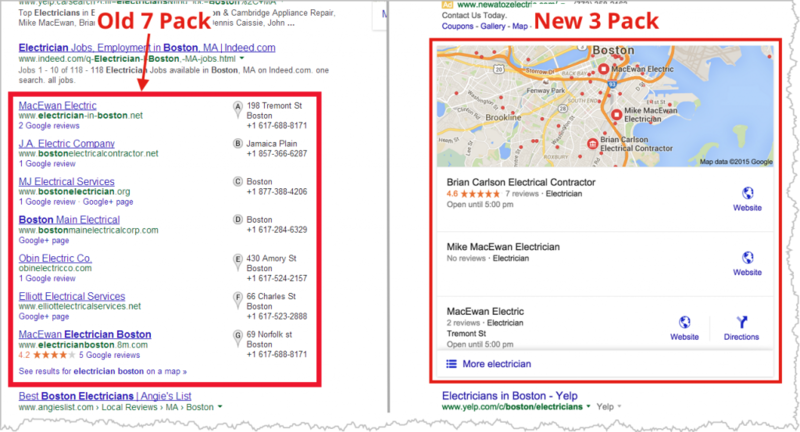 About a month ago, Google – in an uncharacteristic sweeping change – rolled out a new 3-pack format for the map listings, almost instantly replacing the well-known 7-pack format. Phone number and click to call (on desktop search) is gone. Mobile users can still click to call. Full address is gone – it now only displays a street address and not the city. No website URL displayed on either desktop nor mobile version. Business hours are prominently displayed. No link to G+ page. As mobile usage continues to grow higher and higher, Google has changed their desktop search results to appear more similar to the mobile-specific search results; the 3-packs fit perfectly on the screen for mobile users. Regardless of what you search is for, it is those top three spaces that make up the screen real estate for a mobile user, along with the Google map that appears for some local queries. Google’s removal of all 7-packs brings desktop the same user experience as mobile users have been getting for some time. Well, if your listing is pretty well optimized and you’re already in the top 3 results – you’re likely to see a boost. Of course if you are in positions 4-7, well, it’s fair to say your traffic could tank. Remember how over the past three years I’ve been trying to get you to pay attention to your online reviews and build yourself a 5-Star Reputation? If you’re in certain industries, your ratings are going to become even more critical. 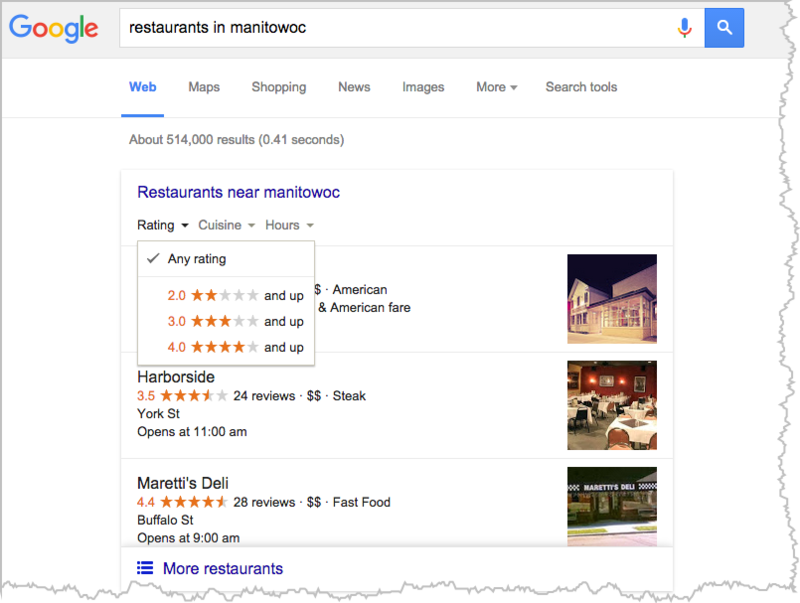 Google has added an option for searchers to select only businesses that are above a certain rating, currently choosing from two stars and higher, three stars and higher, or four stars and higher. We also know that Google likes to test small before unleashing it everywhere. So businesses should anticipate that this star rating selection drop-down is going to appear for other local related searches (emphasis mine). Now’s not the time to be a slacker. The market just became more competitive. The 4 guys below you in the SERPs just became hungry. Real hungry. Now’s not the time to stop marketing. Most of the things that will get you ranked organically will also help here. You’ll learn a lot of this by attending our webinars. Oh, and getting good reviews. Lots of them. Please help everyone learn by posting your questions or comments below. Otherwise, just click the email icon at the bottom of this page and I’ll get back to you right away. Previous PostPrevious Billion Dollar Bully?